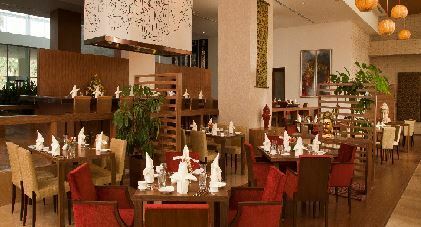 Offering sweeping views of the cityscape, the Radisson Blu Plaza Hotel Hyderabad is situated in the posh downtown district of Banjara Hills. Heavily influenced by Asian architecture, the hotel’s property in Hyderabad combines marble and glass into a chic design. Guests rest well in 154 comfortable rooms and suites and enjoy a selection of on-site restaurants that offer Indian, Asian and world cuisines. Resort-style amenities like an on-site spa, a swimming pool and a fitness center help travelers unwind after attending big events in the stunning ballrooms. In addition, the hotel has the largest room size in the city with four-fixture bathrooms. At 44 m2, these accommodations are the most suitable for long stays, business trips or leisure travel.